A nearby Catholic school hoped to replace the field house with a soccer pitch. By now you've probably heard a thing or two about the showdown between Pilsen residents and Chicago Public School officials over the field house on the playground at Whittier elementary school. For 43 days parents and neighbors occupied the ramshackle, 84-year-old one-story building they fondly call la casita to keep CPS from demolishing it. Schools CEO Ron Huberman said the field house had to be demolished because it was so unstable it might collapse; the protesters wanted him to use the money that would be spent on demolition to repair the building and convert it into the library the school currently lacks. The local press breathlessly followed the saga, which culminated on October 20, when Huberman agreed not to demolish the field house and the parents called off their sit-in. But there's a curious and complicated backstory that's so far gone unreported, involving 25th Ward alderman Danny Solis, congressman Luis Gutierrez, and officials from Cristo Rey Jesuit High School at 1852 W. 22nd Place. Though they're less than a block from each other, Whittier and Cristo Rey are worlds apart. A Catholic school with a predominantly working-class Latino enrollment, Cristo Rey is housed in two buildings that are less than ten years old. Whittier, at 1900 W. 23rd St., is 117 years old and in obvious need of tuck-pointing, painting, and other basic maintenance. On September 30, 2009, Father Jim Gartland, president of Cristo Rey, set up a meeting with Solis, Whittier principal Zoila Garcia, and several Whittier local school council members where he offered a plan to transform the Whittier playground and parking lot into an artificial-turf soccer field. To Cristo Rey officials, it was a win-win situation—they'd oversee construction, paying for the project with a mix of private donations and whatever money they could raise from the feds and state. "We would use it for practices after school," says Peter Beale-DelVecchio, development director at Cristo Rey. 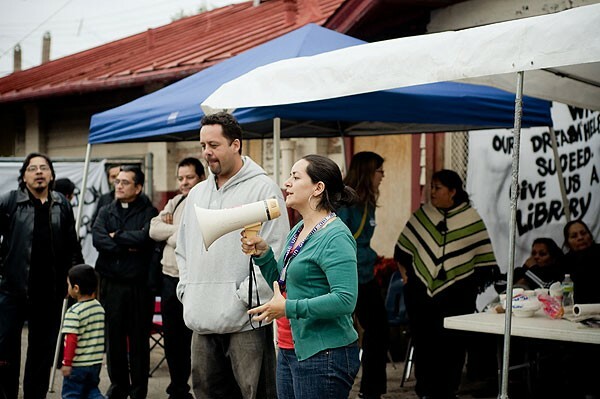 "During the day, Whittier could use it and on weekends it could be a community field." But according to Solis and Beale-DelVecchio, Garcia and the LSC members rejected the proposal. (Garcia did not return calls for this story.) While the school's asphalt playground could use improving, they felt they had more pressing needs—like asbestos removal from the school and the construction of a library and new lunchroom. "We'd been asking Solis and CPS for repairs for years," says Michelle Palencia, a Whittier parent. The parents feared that the soccer project would somehow wind up swallowing money intended for Whittier. Moreover, the soccer field would force the demolition of the old field house, which had become something of a community center, where folks gathered for meetings, GED classes, and activities like sewing clubs. "They made it clear to us that they did not want the field house demolished," says Beale-DelVecchio. "They told us their primary goal was to have a library and a meeting room. We respected that. We said, fine—we're not here to trump your priorities." Nevertheless, Beale-DelVecchio says Cristo Rey left the meeting with a glimmer of hope. He says Whittier officials left open the possibility that if CPS didn't come up with the money to fix the field house, they might settle for the soccer field. On November 4, 2009, Huberman met with Solis and Whittier officials and told them the field house had to be demolished. Solis and Beale-DelVecchio then tried to set up a second meeting with Whittier, but it never happened. "We thought we had a date and Whittier canceled," Beale-DelVecchio says. In January 2010, the Society of Jesuits, acting on behalf of Cristo Rey, submitted a request to congressman Gutierrez's office for $1 million in federal funds for the soccer field. After lawmakers receive such "earmark" requests, they decide which ones to send on to Washington for possible funding. The deadline in Gutierrez's office for the submission of earmark requests was February 16. "Our thinking was that if we didn't get the request in this year, we'd have to wait another full year," says Beale-DelVecchio. "I know it sounds like we were being premature since Whittier hadn't even agreed to the soccer field, but we didn't want to lose an opportunity, as remote as it was." By February, however, it seemed clear to Cristo Rey that Whittier officials, who hadn't set up another meeting, were still opposed to the soccer field. "As far as we were concerned, it was dead," says Beale-DelVecchio. Cristo Rey's soccer teams currently practice in Harrison Park and play their home games at a nearby YMCA. Meanwhile, the dispute between CPS and Whittier parents over the fate of la casita continued. And shortly after the neighbors and parents began their sit-in on September 15, a supporter of the protesters, during a routine Google search, came across Cristo Rey's earmark request on Gutierrez's website. It was one of 52 such requests listed. "The field will be used by students at Cristo Rey, Whittier Elementary School, as well as the residents of the Pilsen and Little Village neighborhoods of Chicago," the listing said. The protesters were alarmed. "No one told us that Cristo Rey had gone to Gutierrez," says Carolina Gaeta, a Pilsen resident and community organizer who'd joined the parents' crusade. "We're like, 'What's going on here that we don't know?'" Several protesters say they called the congressman's office to find out what the request meant and that their calls weren't returned. Alderman Solis says he didn't even know the Jesuits had made the earmark request until Gutierrez called him about the protesters' calls. "He says, 'Danny, Danny—what's with these Whittier parents? Why are they calling me?'" Solis says. "He told me that [city clerk] Miguel del Valle had dropped a dime on him—that del Valle had told those parents about the authorization request because he was trying to turn the parents against him." Del Valle tells me he never directed parents to Gutierrez's earmark request list: "The parents came to me to seek my support and they told me what was on Luis's website." Gutierrez didn't return calls for this story. But his press secretary, Doug Rivlin, says that too much was made of the earmark request. "It was a request for authorization," he says. "That's different from an actual authorization of money." Of the 52 earmark requests Gutierrez received, he recommended about a dozen to the appropriate congressional subcommittees for consideration, says Rivlin. "And not all of those requests will get funded. We're only one of 435 congressmen." The soccer field was not one of the chosen dozen. "We get requests and then we go through a process of whittling them down to see if this is something that people really want," explains Rivlin. "In this case, we circled back and asked people in the district if this is what people want and the answer was basically 'not really.'" He adds, "I understand people are telling people at Whittier that being on the website means Gutierrez was gearing up to pave over their field house. But that's not what being on the website means." Pilsen protesters aren't buying it. "They may be backing off now, but I definitely think something was going on here with Cristo Rey," says Evelin Santos, a Pilsen resident who participated in the sit-in. CPS officials say their decision that the field house needed to be demolished was based on structural studies done in fall 2009. It was just a coincidence, they maintain, that those studies happened at roughly the same time that Cristo Rey was expressing interest in putting a soccer field behind Whittier. The protesters don't buy that either. "There's too many coincidences," says Santos. Are the protesters being paranoid? Well, perhaps prudently skeptical is a better way of looking at it. After all, this saga resembles the infamous Lincoln Park soccer field battle, in which the Park District quietly agreed to let the Latin School build itself a field in Lincoln Park several years after community opposition had killed a similar plan. The issue at Whittier apparently became moot on October 20, when Huberman—who's since announced he'll step down after Thanksgiving—agreed not to demolish the field house. In exchange, the parents and neighbors agreed to keep children out of it and limit the number of adults admitted until the roof is repaired. The two sides are now haggling over who will operate the building. Here's my favorite part of the story. Solis says he's going to dip into the Pilsen Industrial Corridor tax increment financing district fund—as if it were his kitty to dip into—for whatever money's needed to fix up the field house. Mayor Daley and his favorite aldermen—and Solis is a close ally—have gotten accustomed to using TIFs as their own personal slush funds. According to Solis, the money to demolish the field house was also going to come from the TIF. So at the moment Solis plans to spend TIF dollars to save the field house as opposed to destroying it. Neither of these uses is what TIFs were intended for; this particular TIF district was created to foster industrial development and create relatively high-paying jobs. Good thing TIFs are so flexible. Ben Joravsky discusses his reporting weekly with journalist Dave Glowacz at mrradio.org/theworks. Is there anyone out there who truly believes he's so upset over Smollettgate? He's the master of the jock cliche, the gladdest hand in Chicago radio. We're speaking, of course, of Chester William "Chet" Coppock, six feet six of pure midwestern ham, the first, the only--yes--postmodern sportscaster.